Small homes are gaining renewed popularity in the housing market. Many “Baby Boomers” are downsizing to simplify their lifestyles and reduce the costs and time required to maintain a large home. First time home buyers are finding that small homes are a good initial investment. There are also certain design styles of small homes that have withstood the test of time such as craftsman bungalows, cottages, capes, cabins, ranch and prairie style homes that have unique architecture and appeal to buyers. A small home is generally less than 2,000 square feet. For people who are downsizing from a large home, the change may make them feel closed in. For first time buyers who may have lived in an apartment, the home may provide considerably more space. 1. 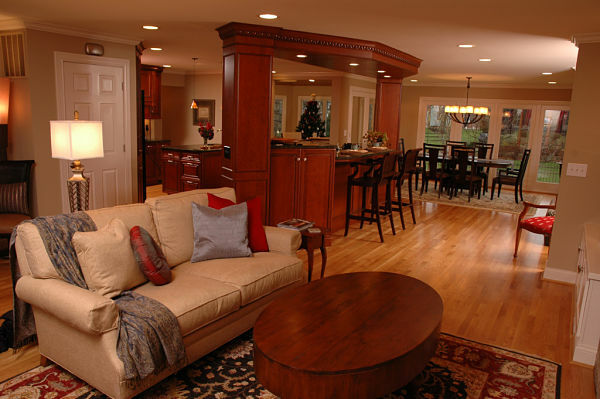 Create an open floor plan by unifying kitchen, dining and living room areas. Interior walls break up the space in a small home. Often the rooms are tight and not particularly functional. This is especially true of dining rooms. An eat-in kitchen of a small home may seem cramped. If the kitchen and dining room are adjacent and separated by a common wall, consider removing the wall to open up the space. If there is a living room adjacent to the dining room or kitchen, the wall could be removed to create more functional space. Removing walls will also make the home seem brighter. 2. Unify the living space with uniform flooring. Use wood floors, one style of carpeting, vinyl flooring or tile to create a flow to the home. Eliminate unlevel thresholds. 3. Limit the wall colors in the home. Neutral wall colors can create an illusion of space. However, you don’t have to use just one color throughout the home. For example, if you limit your pallet to gray tones, use different values of that color in different rooms. One trick is to select a paint color and look for other values on the color strip. Use the lightest color in the darkest areas of the house such as hallways or rooms that lack natural light. Use darker colors to highlight architecture in dining areas or a kitchen. Mid-tones can be used in bathroom and bedrooms. If you desire a pop of rich color, or want to delineate a space, add color or wall paper to one wall. Some color pallets that work very well in small homes are gray, neutral beiges, yellows, gold, creams, ice blues and whites. For more ideas, see our article “Hot Interior Colors in 2012”. 4. 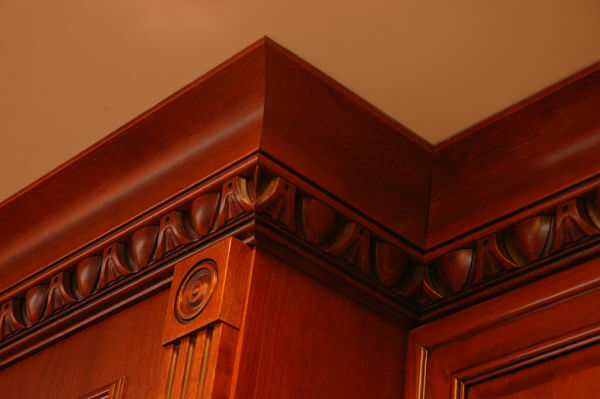 Paint moldings and trims white in each room if natural wood is not an essential architectural element. White trim accents a wide range of wall colors. It is neutral and bright. It will unify the rooms of the home. Trims are often made of pine and are susceptible to nicks and scratches that white paint will camouflage. Consider painting interior doors white, too. 5. Add crown molding to make a room seem larger. The standard ceiling height for a home is 8 feet. Crown molding can elongate the line of a wall and create the illusion of height. 6. Hang curtains near the ceiling. This is a decorator’s trick to make a room appear larger. Hanging curtains near the ceiling also allows more natural light from windows into the room. 7. Use built-in shelving and cabinetry to maximize functional storage. Storage is essential in a small home. Shelving recessed into a wall can provide much needed storage space when every inch counts. Recessed shelving also conserves floor space. 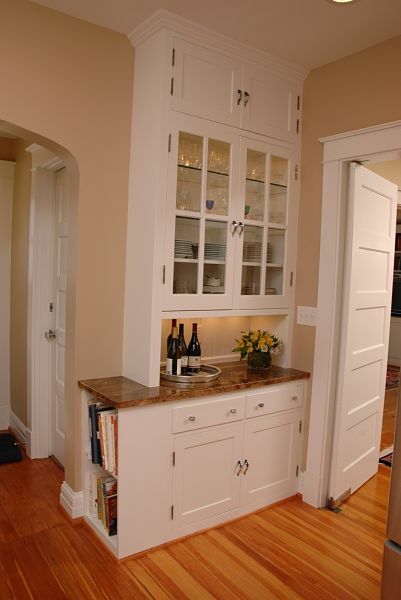 Cabinets help to contain contents and keep the home’s appearance uncluttered. A custom-built buffet is an asset in a dining area and can provide storage for dishes, glasses and linens. 8. If bathroom space is tight, use fixtures and elements that are functional and aesthetic. Base cabinets will restrict space in a small bathroom. 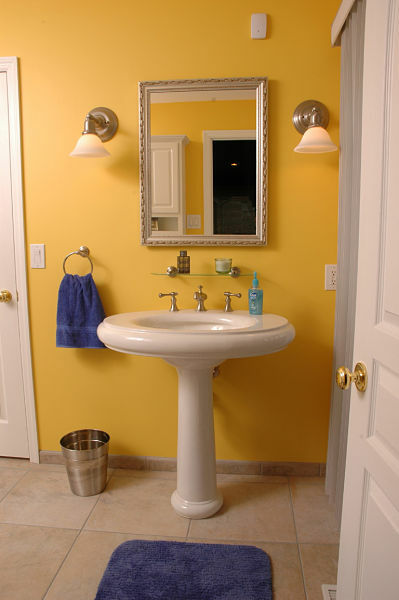 Pedestal sinks have a linear form and use a minimum of floor space to make the room seem larger. Furniture style vanities may also work well and provide a few drawers for storing small items. For storage, consider shelving and cabinets recessed into the wall, again to optimize floor space. A tub/shower fixture will generally fit into a small bathroom. A walk-in shower can also be a space-saver. A mirror will also make the room appear larger. A pocket door can be a space saver and eliminates a door swing into the room. 9. Sacrifice a bedroom for a master suite. If your home has small bedrooms and if you are only using one or two of them consider removing a wall to create a spacious master bedroom. Be selective with your furnishings. Look for quality, not quantity. Visit our idea center and showroom for more tips and solutions for your home. Our project consultants and designers can help you transform a small home into a comfortable and functional environment for you and your family to enjoy. Talk with them about transitions that can improve your home and fit your lifestyle.